Discussion in 'Diablo 2 Community Forum' started by Occulus cant be ethereal, Jun 28, 2010. I was doing LK runs and open the master chest and seen the rune, as I went to the weapon rack in the corner I then realised it was an IST and not an ITH...lol Anyone ever do that? For LK runs in general, I havent done that many (less than 1000) in the past few weeks and just started 1.13 not too long ago. Best thing so far....I dont plan on doing many LK runs though. Minor details; It's a ring, how can it be ethereal??? Can you imagine equipping two of those hacked rings and an actual Occulus? Sure, you'd get +9 Sorc, insane MF and FCR and a nice chunk of resists...but 75% CtC TP when Struck? 75% CtC TP when Struck? Um... Occy rings were pretty common back in the day. 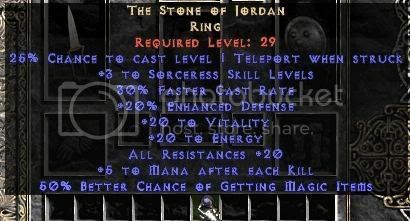 I large majority of the Sorcs used them when Frozen Orb/Nova/Thunderstorm Sorcs were the G.
And On-topic: I never run past any runes because I hold alt and scan the ground like my life depended on it. I also tend to pick up a lot of random crap off the ground to sell for gold.